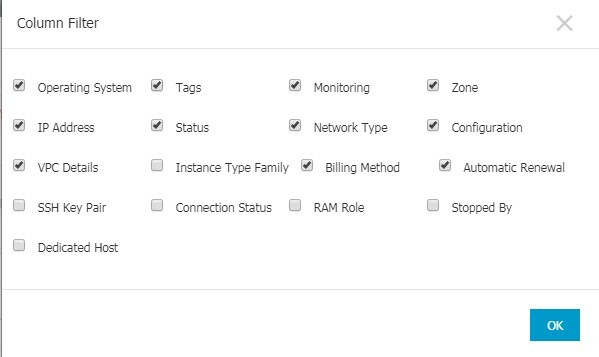 View all ECS instances under your account on the Overview page. View details of an ECS instance on the Instance Details page. Total number of ECS instance, and numbers of instances under each status. Number of resources in different regions and numbers of ECS instances under each status. The homepage of the ECS console is the Overview page by default. On the left-side navigation pane, click Instances. Here, you can see information of all the existing ECS instances in the selected region, including ECS instance ID/name, zone, IP addresses, status, network type, billing method, and actions. You can show or hide the displayed information of an instance by using the Column Filter feature. In the upper-right corner of the Instance List, click the icon. Select the instance information to be displayed and then click OK. The Instance Details displays detailed information of a selected ECS instance. Find the ECS instance you want to view the details of, and then click its instance ID. Basic Information, including the ECS instance ID, instance name, region, zone, instance type, instance type family, image ID, key pair name (applies to Linux instances only), instance RAM role, and tags. Configuration Information, including CPU, memory, I/O optimization, operating system, IP addresses, billing method for bandwidth, current bandwidth, and VPC network information (applies to VPC instances only). Payment Information, including billing method, the mode to stop an instance, creation time, and automatic release schedule (applies to Pay-As-You-Go instances only). Monitoring Information, including CPU and network usage. You can also switch from the Instance Details page to the Disks, Instance Snapshots, or Security Groups page to view resources related to this instance.